About 5 inches long with a 12 inch wingspan. Narrow tail. Sooty grey-brown upper, paler grayish brown underneath, grayish white on the throat, black wings. Used to inhabit forests, now mostly in cities throughout the Great Plains to Eastern U.S, and southern Canada. Migrates to northern and middle South America. 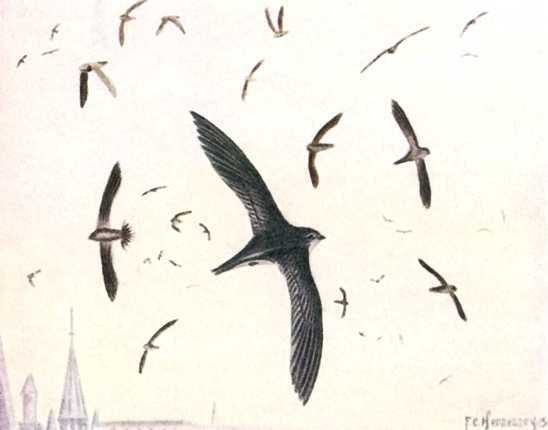 Flocks of Chimney Swifts swoop gracefully like swallows overhead catching flying insects in evenings or cloudy days all the while emitting high pitched twittering notes. 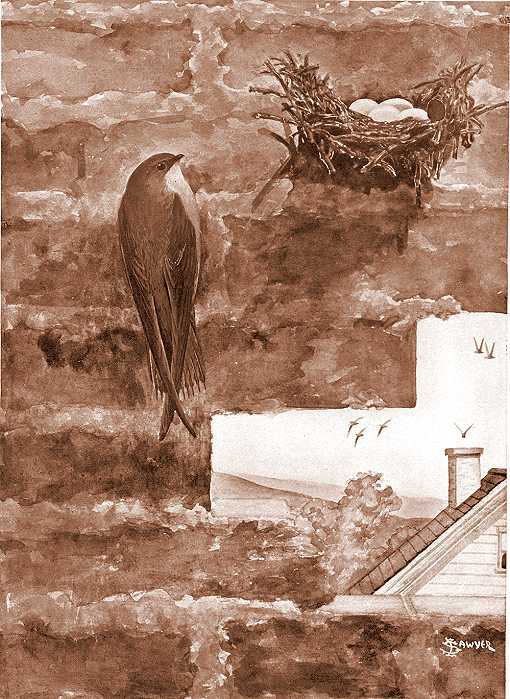 The Chimney Swift’s ancestors used to nest in forest tree hollows. 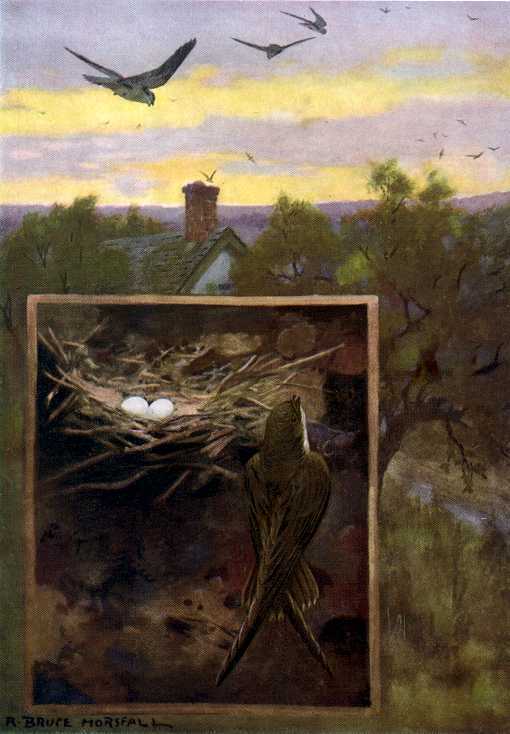 Now they suspend their unlined basket like nests of twigs glued together with saliva inside little or unused chimneys and many people are having success attracting flocks to Chimney Swift Towers. They snap thin dry twigs about an inch or two long for their nests from dead branches while in full flight. Females lay 4 or 5 white eggs which hatch after about three weeks and young fledge in about another four weeks. We think the ideal chimney tower would be, well, a brick and mortar chimney. Wood towers are some popular, however, they require preservation maintenance. If you’re up to it, no problem. Many are. When choosing a chimney swift tower design, consider the consequences of a significant construction. Large abnormal things (like a chimney or wood tower), lower a property’s value mainly because they’re expensive to remove. Even if a home price is discounted many buyers just don’t want to bother. If your home has been in the family for years and you expect it to continue to be, maybe a farm, then this doesn’t apply. Our choice is a real chimney on a solid foundation with some access for cleaning underneath. An alternative any birder might consider is finding where chimney swifts nest. Our experience was searching for the nesting site of a large number of chimney swifts feeding everyday in a major city. The nesting site turned out to be an older elementary school with a large, tall chimney. The chimney probably served an old coal furnace that was no longer used. It was a real treat to see the swifts return to their nests on any early evening we were inclined to go watch without ever having to build a tower. No chimney swift tower designs here. There are plenty of designs on the internet and you could probably come up with your own. They are major projects. Consider all the consequences of building a large object, plan well and work safely. We think the ideal chimney tower would be, well, a brick and mortar chimney. Wood towers are some popular, however, they require preservation maintenance. If you’re up to it, no problem. Many are. When choosing a chimney swift tower design, consider the consequences of a significant construction. Large abnormal things (like a chimney or wood tower), lower a property’s value mainly because they’re expensive to remove. Even if a home price is discounted many buyers just don’t want to bother. If your home has been in the family for years and you expect it to continue to be, maybe a farm, then this doesn’t apply. Our choice is a real chimney on a solid foundation with some access for cleaning underneath. An alternative any birder might consider is finding where chimney swifts nest. Our experience was searching for the nesting site of a large number of chimney swifts feeding everyday in a major city. No chimney swift tower designs here. There are plenty of designs on the internet and you could probably come up with your own. They are major projects. Consider all the consequences of building a large object, plan well and work safely.